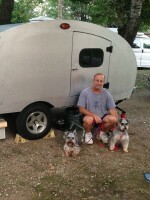 Teardrops n Tiny Travel Trailers • View topic - Power Converter from Computer??? I have access to old computers these have power supplies in them that convert 110 ac to 12v dc. Some of the DC out put varry: .5 up to 8 amps. Could these be used in a tear application? Last edited by Dee Bee on Thu Nov 11, 2004 6:04 pm, edited 1 time in total. The larger ones will work just fine. I have friends that use them for power supplies all the time for battery charging in our radio control hobby. Since they are voltage regulated, all you'll have to do is plug them in and hook them up to the battery. Have one you want to get rid of? I think it would work but I wonder how charged the battery would be? A typical deep cell battery isn't fully charged until 12.7 volts. That means you need to charge them at about 13.7 volts to recharge them to full capacity in a reasonable amount of time (say 5 to 7 hours). I, too, use a computer power supply to as a 12v source to charge my radio control airplane batteries (the power supply powers the charger which usually uses a 12v bat. as input)... it requires a load (I use 2 taillight bulbs). It works great, but it isn't a particularly easy thing to do... have to have the right power supply and find the right wires going into the power supply, of which there are dozens. You might try a search and see if you can find any instructions on the net. arnereil wrote: I, too, use a computer power supply to as a 12v source to charge my radio control airplane batteries (the power supply powers the charger which usually uses a 12v bat. as input)... it requires a load (I use 2 taillight bulbs). It works great, but it isn't a particularly easy thing to do... have to have the right power supply and find the right wires going into the power supply, of which there are dozens. What topic would you use to search for this info? I am stumped. Has anyone had experience with a project like this? That's way over my head, but it looks pretty kewl!! !